German heavy metal has certain standby elements that make things distinctive from other scenes. Beyond those hooks, synchronized stage moves, and melodies, the sense of community is second to none- fellow musicians aiding the cause where they can. 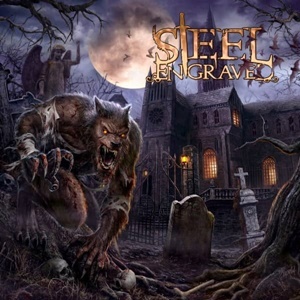 Case in point- the third self-titled album from Steel Engraved. Vocal production took place with Ralf Scheepers (Primal Fear), and main production duties fell in the hands of Serious Black members Mario Lochert and Jan Vacik – with Ralf also offering a vocal assist on “Searching for Regret”. Even though it’s been seven years since the last album On High Wings We Fly, the 13 tracks this quintet deliver sit in that sweet spot between melodic heavy metal and power, with occasional flashes of symphonic elements to keep the material slightly versatile and dynamic. The band possess an interesting combination of pushing modern guitar tones into their crunchy, gallop-oriented riffing, using the keyboards as a subtle middle of the road aspect and letting the metal shine so to speak. “Generation Headless” is an early favorite between the gritty speed to mid-tempo shifts and an easily headbanging chorus with a singalong element to boot. At other times you can feel the German-esque melodic hooks command attention, sort of the Priest/Accept homage during “The Oppressed Will Fly” and “Rebellion”. Stratovarius comes to mind in certain aspects of the keyboard/guitar use and lower, comforting melodies from vocalist Marco Schober -who may not necessarily be the smoothest, high pitch singer, but makes do on “One by One” plus the opener “Where Shadows Remain” with an engaging grit and capacity to channel a lot of Tobias Sammet qualities. The production values keep Steel Engraved as natural as possible in this digital world – you can feel the real tom hits and snare sound without samples and triggers weighing things down, and the guitar, keyboard, bass balance isn’t squashed to allow the melodic heavy metal songs to shine. “All That Lies Below” is a bonus track that as a ballad contains some classical elements and theatrical vocals and could have easily been on the main album as it showcases Steel Engraved in a more ‘Phantom of the Opera’-like atmosphere. This probably won’t top many critical acclaim lists – as it’s solid heavy metal but not going to necessarily make people gasp or take their breath away. Sometimes we all need the meat and potatoes bands in our lives, and as such Steel Engraved are very good at what they do.